Norton High School hockey coach Kyle Heagney drew up a play for his team during a game against Durfee High last Thursday. High school hockey, in the opinion of Norton varsity boys’ coach Kyle Heagney, is a perfect microcosm of life. “It teaches kids about the rest of the world — life skills, sacrifice, commitment, challenge,” said Heagney, who, off ice, is Attleboro police chief, a position he has held since 2011. 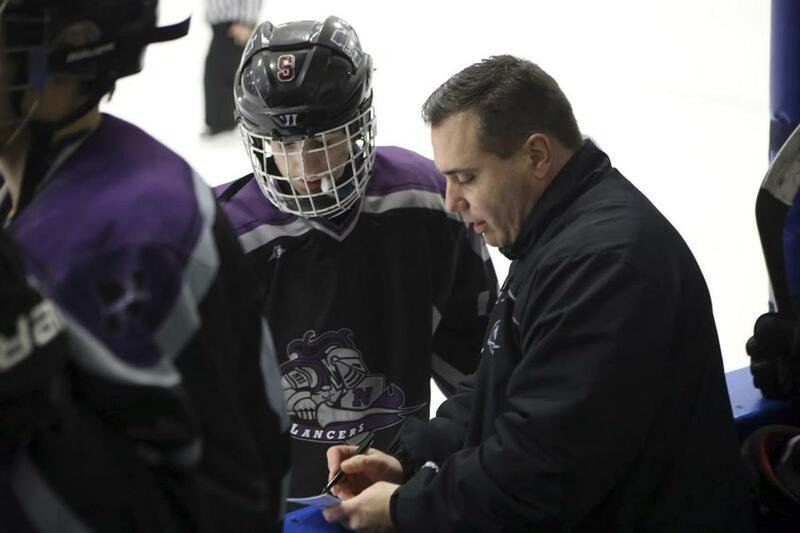 Heagney is one of a number of first responders in the region who have gravitated toward high school hockey as head coaches and assistants. Jim Genovese, head coach at Foxborough High, is an officer with the Marshfield Police Department. Franklin coach Chris Spillane is a sergeant on that town’s police force. And Hanover coach Jon Abban is a detective. Five goalies making their mark this season for varsity boys’ hockey programs in communities south of Boston. The majority have a playing background. And most try to use the lessons learned as first responders to try to develop not only successful programs, but also steer young adults onto a path of success. Heagney, who played hockey at Bishop Feehan, served in the military after high school before starting his career in law enforcement. He launched his coaching career as an assistant at Bishop Feehan before he was hired as Norton High’s first coach. He is also an assistant coach for the Neponset Valley River Rats U16 team that won a national championship in 2013 and has produced several Division 1 hockey players. He keeps his self-funded program afloat by donating his entire $4,500 coaching salary back to the team. Through it all, the motive has stayed the same. A team is judged on its wins and losses by outsiders. But the game means much more to the coaches who dedicate their time in helping others on and off the ice. Genovese, a former player at Marshfield High and Suffolk University, is in his first year as a full-time officer in his hometown. Abban, who played at New Hampshire College and University of Massachusetts Boston before joining the police academy his senior year of college, noted how police officers are a fraternity. Abban, who is in his fourth season as head coach at Hanover after serving as an assistant for two seasons, has worked in the Hanover Police Department for 20 years. He lauded a great support system in Hanover. Abban is always encouraging the members of his team to give back to their hometown. “It is certainly a community-based effort,” he said. “We encourage the kids to give back, and get out in the community. I’m a product of this town. The town’s been great to me. Joshua Brown can be reached at joshua.brown@globe.com.